73. Where is God in the Megilloth? In Where is God in the Megilloth? Brittany N. Melton constructs a dialogue among Ruth, Esther, Lamentations, Ecclesiastes, and Song of Songs centered on this question, in an effort to settle the debate about whether God is present or absent in these books. Their juxtaposition in the Hebrew Bible highlights their shared theme of apparent divine absence, but, paradoxically, traces of God’s presence are unearthed as well. 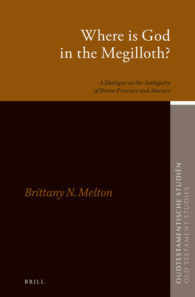 By examining various aspects of this theme, including the literary absence of God, divine abandonment, God-talk, allusive language, God’s providence, and divine silence, it becomes clear that the ambiguity of divine presence and absence in the Megilloth presents a significant challenge to current conceptualizations of divine presence and absence in the Hebrew Bible.